Davido’s now famous girlfriend, Chioma Rowland, is not keeping calm at all as she wants to take over the social space by storm. The pretty chef recently released a number of photos on social media, showing off her pretty cloth collection as well as giving her fans style goals. 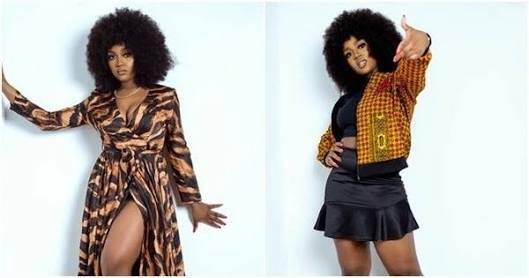 Chioma is gradually becoming a fashionista and she is probably a muse to some designers who find her appealing enough to help publicise their items. Chef Chi shared several different photos showing off her attire as well as her cute Afro wig. Perhaps she was giving her fans some dose of old school with new school fashion vibes. She effortlessly rocked a lilac top with yellow pallazo pants, paired with a yellow bag and cute high heel shoes. Chioma also rocked this long yellow net dress really well, and she paired it with black boots. She used to be famous only for being Davido’s girlfriend, but she has started to carve a name for herself as a talented chef as well as a fashionable lady. Chioma sure looks feisty in this animal print flowy dress. She also rocked this black jumpsuit with tribal details effortlessly. Chioma showing off her lovely curves in this beautiful blue outfit. Finally, Chioma looks retro in this simple all black outfit which she made more lively with her red shoes and ankara jacket. She is no doubt a stylish lady. Chioma came into the consciousness of people after her boyfriend, Davido, gifted her with a luxury car on her 23rd birthday, and he called it assurance. He also featured her in the music video of his song, Assurance, which he dedicated to her.